If Supranational Government Is Necessary For Peace And Cooperation, When Will The Vatican State Join The EU? Yesterday, this blog took to task the motley crew of Christian bishops and other assorted British faith leaders who signed their names to an insufferably glib and ignorant letter imploring the British people to vote to remain in the European Union in the 23 June referendum. But the Archbishop Cranmer blog has now gone one better, and published a satirical spoof article reporting that the bishops had actually called for Pope Francis to commit the Vatican State to joining the EU – the joke being that the bishops would never dream of insisting that the Vatican surrender sovereignty to Brussels but are perfectly happy to demand that Britain does the same. Religious leaders from the UK’s main faith communities – including former Archbishop of Canterbury Rowan Williams – have joined forces to urge Pope Francis to commit the Vatican State to joining the EU, saying membership is vital to preserving peace, fighting poverty and tackling the migration crisis. In a letter in the Observer, 37 leading figures from across the faiths say that they hope the Pope will reflect on whether joining the international institutions charged with delivering these goals might contribute to a fairer, cleaner and safer world. The letter is obviously not endorsed by any Roman Catholic leaders, but is signed by Anglican archbishops and bishops, Church of Scotland academics, reverend professors, deans, distinguished rabbis and imams, ecumenical coordinators, baronesses and peers, leaders of Sikh and Hindu faith communities, and Global Leader Steve Chalke MBE. And who can argue with this faultless logic? If we accept the Remainers’ fatuous assertion that Britain must remain in the European Union because only by being subordinate to a supranational government based in Brussels can we work pragmatically with out neighbours to solve problems which transcend national borders, then why should this not apply equally to the Vatican? In fact, why should it not apply especially to the Vatican, being both an extraordinarily rich state and a hugely influential one, often bypassing other national governments to lay a claim on the hearts, minds and souls of people in countries all over the world? Given the Vatican State’s unique advantages in this regard, surely (according to Remainer logic) it is practically criminal for the Pope to stubbornly hold out, clinging to anachronistic national pride and refusing to be subsumed into the greater European whole. And yet nobody makes this argument. The Vatican is left to go about its business as a sovereign state unmolested – quite rightly. But the fact that the European Union’s Christian cheerleaders would rather not afford Britain similar freedom is yet more proof of the inconsistency and subjective nature of their case. Britain is and will always remain part of a “bigger whole” whether we remain in the European Union or not. The European Union is a political construct, and a very recent and unproven one at that. It is not interchangeable with the continent of Europe, and it has no democratic legitimacy when it arrogantly claims to speak and act on behalf of the many diverse European peoples. There is a positive case for Brexit based on leaving euro-parochialism behind and engaging more fully in the world, and pro-EU Christians participating in the debate should at least acknowledge this fact rather than arguing against the two-dimensional cartoon Ukipper they hold in their minds. [..] Seriously – boil down most of the [Christian pro-EU arguments] and they amount to little more than that. You’ll hear endless variations on the theme that because we are all brothers and sisters in Christ, somehow it naturally follows that we should be united under the same supranational political umbrella – though curiously the Church of England never wastes its time clamouring for Asian countries to merge together, or for Canada, Mexico and the United States to institute a shared parliament. So, about that rigorous, intellectual, Christian case for the European Union – where is it? What to do when the established church makes no attempt to hide its hatred for conservatives? Those who watch Gogglebox are no doubt familiar with the Reverend Kate Bottley, whose ambassadorship for the Church of England probably reaches many millions more people than most bishops. Should we be concerned, then, that one of the established church’s most high profile characters holds a seething contempt and hatred for one of our country’s two main political parties? She wasn’t wearing her dog collar this week, but she doesn’t need to: the whole country knows (and so do Channel 4 editors and producers) that she is a Church of England vicar and a minister of the Word. And she is very well liked and respected: there is no hint of moral or doctrinal delinquency, but national admiration for her personal spirituality and great teaching capacity. She is a manifestly gifted, active communicator who is dedicated to serving her parish. But ministry isn’t simply service, for that is the whole of Christian life. Her task as a vicar is distinctively liturgical, catechetical and pastoral, principally for the needs of the whole Christian community, including Tories. As an ordained priest, she is both servant and shepherd among the people to whom she has been sent, and that includes Tories. Her task is to proclaim the Word of the Lord and to watch for signs of God’s new creation, including in Tories. Her vocation is to teach, admonish, feed and provide for her flock, which includes Tories. The majority of England is instinctively conservative: it appears to be a natural disposition; an affinity with the natural order; part of the psyche of essential Englishness. The Rev’d Kate Bottley is by no means obliged to approve of that: indeed, she is free to repudiate its consoling power and turn her religious fervour to more meaningful transcendent bonds. But you’d think there might be some sensitivity to the political-philosophical implications for mission praxis. Why should those Tories who attend her church bother to listen to her tell the story of God’s love, if all the time she is pinching her nose at their spiritual halitosis? Why should all those Tories who watch Gogglebox even consider walking with her in the way of Christ, hoping to be nurtured and encouraged in their faith? Why should they gather round the Lord’s Table if their vicar deems them to be unworthy or unable to resist the evil philosophies of men? Bottley is far from an isolated case. Seething anti-Tory sentiment clearly exists much higher up in the church hierarchy, too, judging by the Bishop of Manchester’s decision to play host to Jeremy Corbyn and a left-wing rally coinciding with the Conservative Party conference taking place in the city. 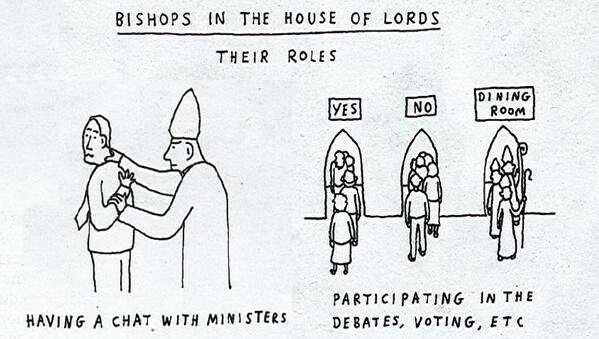 Long gone, it seems, are the days when the Church of England was commonly known as the Tory party at prayer. And with church personalities using their pulpits to inveigh against right-wing policies and pontificate on the supposed dangers of Brexit, the time has come to urgently look again at the privileged position which the partisan established church holds in our constitution.